The Fort Point Arts Community is pleased to announce 3, the first invitational art exhibition of the new season, corresponding with the inauguration of the 2010-2011 Gallery Committee. 3 features three Fort Point artists that, in the opinion of the Gallery Committee, have been under-recognized, yet display the high caliber and diversity of contemporary painting that is representative of the vast wealth of talent which calls Fort Point home. John Hansen can be described as a meeting of The Ash Can School and the Psychedelic. 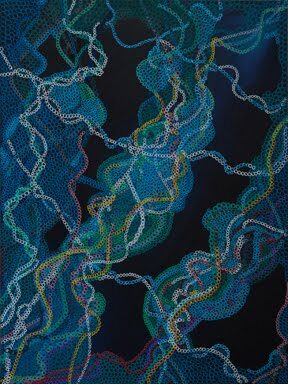 Claudia Ravaschiere ventures into the abstract, with detailed, cellular meditations with a Chuck Close-like system of parts. Andrew Woodward blends the graphic and architectural with a colorist’s formality to make iconic daily surroundings.